What a windy SW run of days to open the month of May on the OBX! Since May 1, it has been non-stop warm sunny SW every day!! I missed the weekend OBX wind to attend my buddy's wedding in WV. It was an awesome time, and congrats Jack and Andrea!! A few of the local crew called me while I was in WV, but I patiently awaited my return as the forecast remained solid, and today I was welcomed home to more SW action! I took an "extended lunch break" sesh at the Washout about 5 miles south of Oregon Inlet Bridge. The Washout is the first semi-paved parking area oceanside after crossing the south side of the bridge. Its a fun spot this year with two solid sandbars north and south of the launch, and a wide expanse of beach providing clean wind on the inside. Today, the surf was small, but the wind swell was looplicious on the outside! I tried the GoPro deck mount, and caught some fun footage, including my first video captured one-handed FWD! Quite fun! I was solo at the Washout today. Conditions were juiced 4.7m (definitely could have been on the 4.2m), sunny skies, warm air, and surprisingly warm water! I wore a 4.3m fullsuit, but could have been in trunks as the water was well over 70 degrees! Beginning of May, heck this is June weather/water!! Hope it lasts, though some bigger surf would be cool?! All the aerial work looks like TOP GUN! Great vid and nice camera angle! Can you show a pic illustrating your safetly line attachment to the camera? Glad you all enjoy the video! Great practice session for the upcoming Jammer LoopOff in 10 days! Regarding the mount, I will snap a pic next time I have ready to go. Main thing is that I used downhaul line and noose knots. The camera noose wrapped between the GP camera housing and the swivel tightening screw attached to the camera mount. The other noose wrapped around the mast foot, and I wrapped the excess slack around the mast foot until the line was fairly tight. Definitely recommend using a safety leash for the camera, and this setup worked great (well tested too since I was about 200 yards offshore when the plate adhesion failed due to the sail hitting the camera after a 40 gust slam). 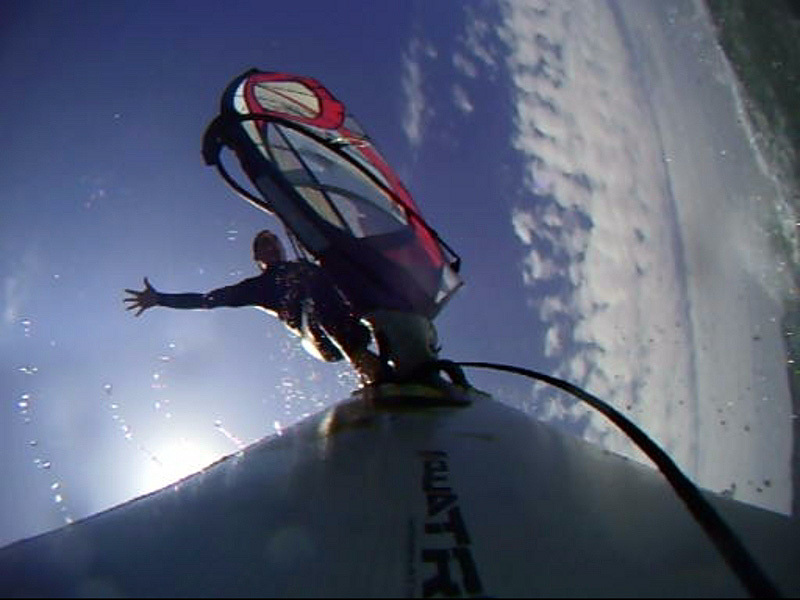 Other than that though, the adhesion held up excellent given all the jumps and loops I threw while filming! Okay, thanks Bill, a pic of the line around the housing will help.